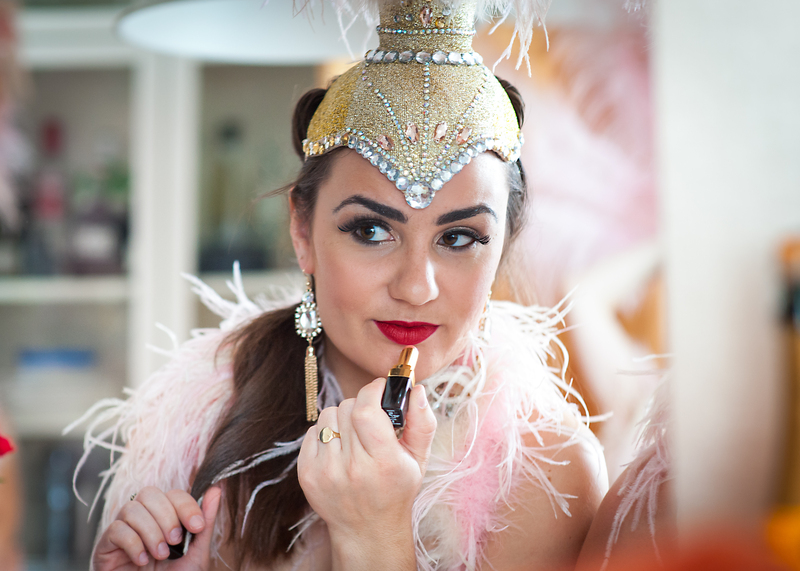 Having performed over 110 shows with The Flaming Feathers we get to know one of the troupes longest serving showgirls…Katie Bunting.. I started dancing when I was 11 year’s old. I had auditioned for the Wyvern Theatre Summer Youth Project but with no dance training or singing experience (apart from the school choir) I didn’t get in. Rather than give up I joined a local dance school and started singing lessons, the next year I auditioned and got in! Dancing has been a huge part of my life ever since. What made you want to be part of The Flaming Feathers? I love to perform and I’m always looking for a new challenge. When Claire set up the Flaming Feathers I was inspired by their characterful routines packed with energy and just wanted to be part of the fun! What has been the highlight of the past 4 years performing? This is a tricky one, having performed in over 100 shows with the Feathers there are so many amazing memories. Two highlights that stand out are getting to perform in the incredible Blackpool Tower Ballroom and dancing Candyman for the Royal Navy! Easy – both my tassels falling off on stage in one of my early shows! To make things worse my parents were in the audience at the time. I’ve got much better at taping my costume since then! Hmmmm it’s a close one between Candyman and Swing, both high energy, fun routines that I love to perform! What are people’s reaction when they come to see you perform? They love it! My work colleagues came to watch last year and I think they got to see a lot more of me than they perhaps expected, but they were dazzled by the glitz, glamour and high-kicking fun. I tend to get inspiration from lots of different people rather than have one icon but I love Jasmine Meakin’s choreography and you can’t fault Beyonce. I love how she is so committed to her performance and gives everything every time you see her dance. What are your goals/aspirations for this year? I always like to challenge myself and push myself to get that little bit better and give a little bit more. This year I want to particularly focus on my technique and flexibility. A few years ago I tore my hamstring and it’s taken a long time to get it back to full strength but now that it has I’m excited to be able to challenge myself again. Any advice to a budding dancer/performer? Don’t give up. Listen to any advice you’re given and practice practice practice. Watch and try lots of different styles as it will help you to become a more rounded performer. And most of all enjoy it! Shake off those nerves and love every second you are on stage because then the audience will love it with you! 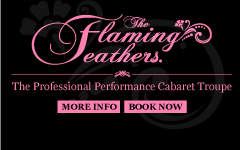 See The Flaming Feathers next cabaret show at Chapel Arts Centre Bath on 11th June….